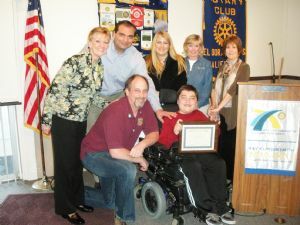 SUPERSTAR STUDENT- Rotary Student of the Month Ryan Manriques received nothing but praise at Wednesday's Rotary breakfast. Lakeview Elementary School teacher Julie Ryan said Ryan always has a smile on his face and an entourage as he makes his way around campus. Pictured are: Back row left to right, Rescue Union School District Superintendent Dr. Carol Bly; proud dad Tom Manriques; beaming mom Carrie Manriques; teacher Julie Ryan and Principal Judy Chance. Front row Rotary Club President Bill Tobin and Ryan Manriques.